Almost ended the article right there for lack of evidence. From slow-closing toilet seats to marijuana-made-mobile, people are – and government, comprised of people, is – enamored over the extravagant, captivated with the costly, beguiled by bureaucracy. We are ever in search of a better mousetrap. “According to the United States Patent Office, over 4,000 people have tried to invent a better mousetrap,” the most reinvented device in United States history. From rodents to regulations, when machinating over mice or money, two – maybe three – things are best kept in mind: criteria and constraint. Then, based on criteria, there’s constraint which concerns cost. Lacking real-world-constraint, let alone control, over costs is what you get in government and the private sector too for that matter when the consumer in both cases is gullible. Child-friendly toilet seats are now available with built-in soft-blue nightlights (optional) and feature “controlled-fall technology” – aka equipped with anti-slam, child-safe, pinched-finger protection. However, should the toilet seat fail to fall like a gently floating snowflake and rather crash down in an avalanche of pain, the problem could be a clutch-spring needing replacement. Or, depending on the model, it could be equipped with a shock-absorber and since the shock is now being absorbed by tiny fingers the question becomes can you send it back to the factory even if it is no longer under warranty? And what of the physical, developmental and behavioral milestones of potty-training that have been set back to Day One because the child is now traumatized by the toilet? Let alone, horror of horrors – which not even one of those six Internet toilet trouble-shooting experts can assist you with because you’re having trouble communicating – should your latest and greatest commode not have recognized, apparently, who was about to use it and for what; and did not therefore, evidently, select whether the seat position should be up or down; and did not, furthermore and obviously, regulate the water volume needed to flush because you’re now ankle-deep, what then? Whose idea was this infernal Rube Goldberg toilet? 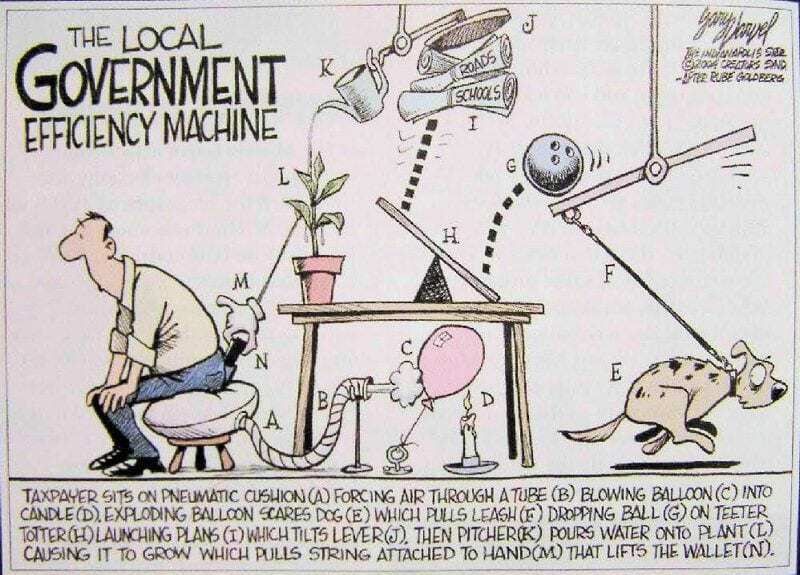 Anytime, which is most of the time, “a contraption, invention, device, or apparatus that is deliberately over-engineered to perform a simple task in a complicated fashion, generally including a chain reaction,” it’s government gambling on the gullible. “Voters are increasingly placing their trust in government to solve their problems, despite its endless record of incompetence,” writes Michael Tanner for “National Review”. There are times though when government gets it right. House Bill 1466 – officially titled “Banning marijuana billboards” – is an example. Under this Bill, can cannabis companies communicate on a car to consumers? May a mouse mascot market marijuana to motorists on M Street? No, not on any street. No. No inflatable tubes, no persons in costume, no wearing, no holding, no spinning messages about marijuana. Well, what about . . .
‘No,’ is sometimes, rarely in government, but sometimes and refreshingly so, a complete sentence. Thinking of a better mousetrap? First ask, what’s the criteria? Then ask, what are the constraints? Or better yet: just say no. I both agree and disagree with ““Voters are increasingly placing their trust in government to solve their problems, despite its endless record of incompetence,”. I don’t think it is a matter of trust, but more that modern society has shied away from any personal responsibility, thus wiling to relegate any decision that they are not willing to make themselves. We have become reliant on others making decisions for us that we have given away personal freedoms to those that are supposed to be guaranteeing our freedoms. Both Gary Turney – ‘just because you can doesn’t mean you should’ – and Paul Nimmo – ‘deferring personal responsibility to others’ are good takeaways from the article.